The Blickling Shed really is one of the show pieces from the National Trust line of sheds by Crane. 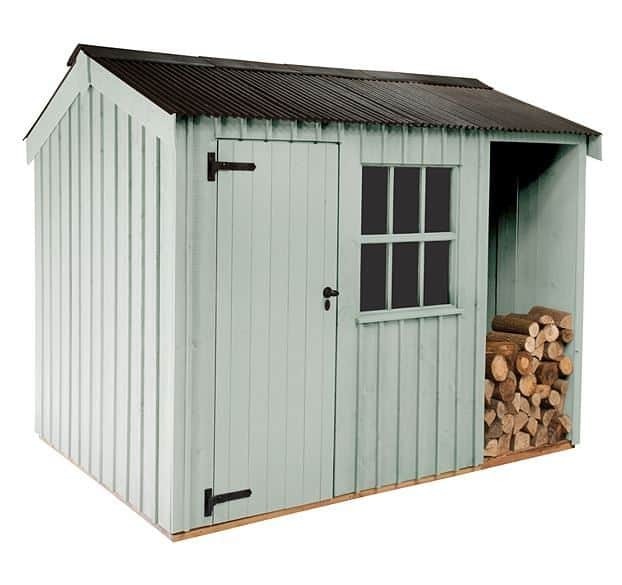 They put more effort into researching classic English style sheds from East Anglia than I did my whole GCSE’s! 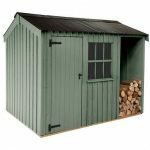 This is the smallest version of this shed that Crane offer, but in its smaller stature it still oozes charm and with its log store…. Which we are sure is the first thing you noticed about the shed and it gives this shed a look and style that really does make it quite unique. While it is called a log store we have to be honest and say we know very few people who actually store logs in there! So you can start to think of all the things you can use that extra bit of storage space for. 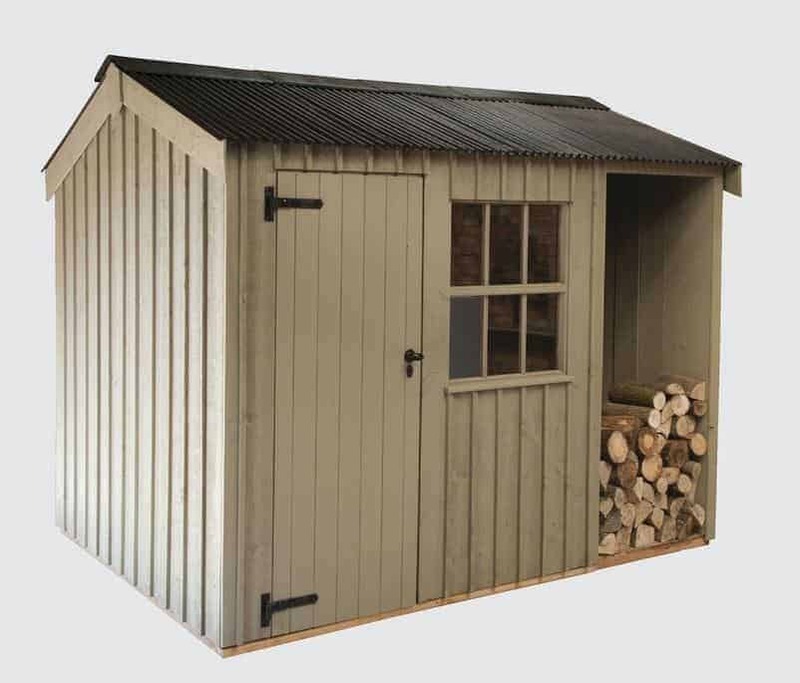 While your eyes are first of all drawn to that log store, you will also notice that lovely corrugated roof which was something that most sheds had back in the day and it really does just add to the overall style of this shed. 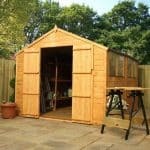 A Georgian style window and a nice, strong door just make this a shed that is very easy on the eyes and something as soon as you see it, you are thinking of the possibilities of things you can do with this shed. That corrugated roof is really nice! Can take up to 12 weeks to be installed in your garden! This is a shed that has just such a striking first impression that you may just start throwing money at the screen…… but wait, put your wallet back in your pocket and check out our more in depth look at the Crane, National Trust Blickling Shed. 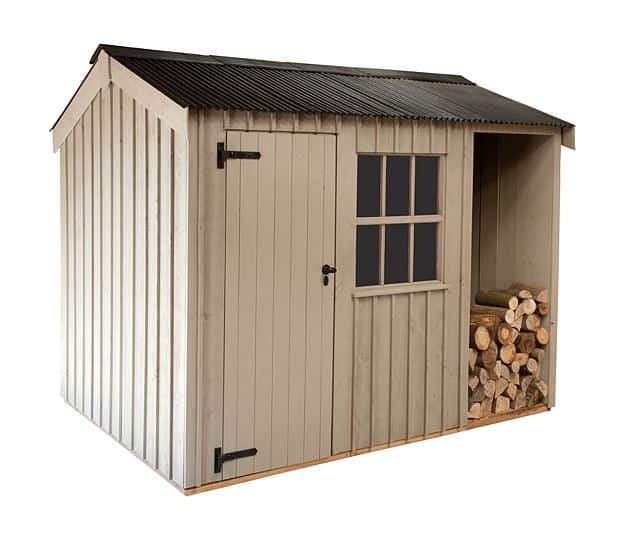 Look we may have said this is the smallest option that this shed comes in, but it is still a decent size. The roof at its highest point is a very respectable, 7 feet 9 inches high. 9 feet 8 inches is what you have to play with as far as the length goes and as far as the width goes you have 5 feet 9 inches of space. As you can see this is some very respectable space that you have here. And of course you also have that extra space of the log store which offers you another 2 feet 9 inches of width and also 5 feet 9 inches of height. 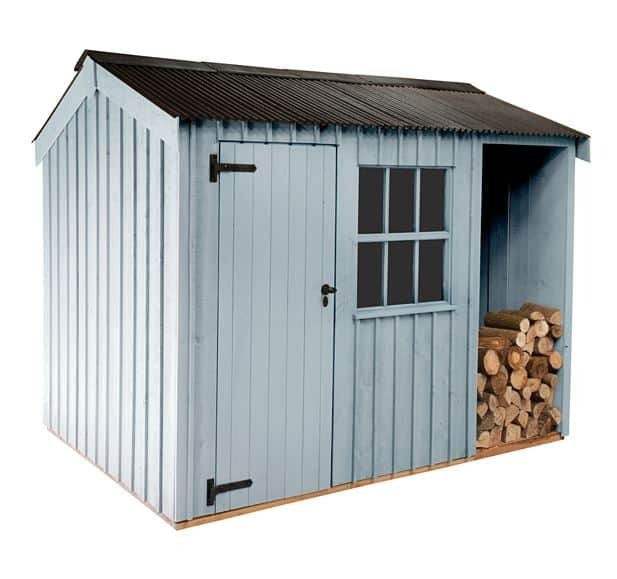 So this does add quite a bit extra space to the shed, but we will warn you there is no door here so make sure anything that you do decide to store in here will not get destroyed by our bad weather. Crane go above and beyond with their roof and this is really what this line of sheds is known for. 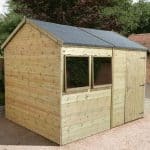 An apex style (to make the run off) corrugated roof made from high quality corrugated roof sheeting really does make this a nice looking shed and if you do have a “English” style of garden it will really fit in well. The roof is made from these very tough (and great at keeping the water out!) 16 x 125 mm tongue and groove boarding. Scandinavian Redwood……. Now if there is a kind of wood that fills your mind with images of a big, strong lumberjack chopping down a monster of a tree it is Scandinavian Redwood! This is what is used to make this shed and wow is this some rough, tough and long lasting wood! Crane have opted for a sawn board cladding style and it does give the shed a very uniform and British look and Crane have made sure that it is tough, but also that it looks incredible as well. One thing that we always are concerned about when checking out a new shed is the frame. Many a great shed has been let down by a weak, flimsy and poorly constructed frame. Crane however use the same strong Scandinavian Redwood that the cladding is made from (we which already said was strong) and at 38 x 50 mm it really does give the shed a strong skeleton that is going to be able to take a little bit of abuse over the years……. and the kids or grandkids messing around in the log store! This is a rough and tough kind of shed and to make sure that you can store whatever you want in here, Crane have made the smart decision to use the same 16 x 125 mm thick, tongue and groove boarding that is under the corrugated roof. These floorboards sit on top of some 38 x 50 mm floor joists which are laid out in a sensible manner to make sure that the weight is even distributed through the shed and that there are no weak spots. Unless you plan on storing a couple of baby elephants in here then you will be fine. 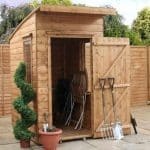 Now when you are spending over two thousand pounds on a shed it goes without saying that you should be taking good care of it and making sure you look after it. Well just in case there is any “problems” Crane do give you a two year warranty, but this only covers general and natural wear and tear and not things like you driving the mower through the wall, you falling through the roof and so on! So in other words, accidental damage is not covered. We think that the warranty that Crane are offering here is fair and very much in line with what other companies are offering. Most Crane sheds make use of the same 710 x 1800 mm door (which this one does also) which just seamlessly fits in with the rest of the shed. This is a good sized door and unless you are trying to get something really huge in there, you will not have any trouble getting things in and out of here. The door will be standing strong for years thanks to the strong and nice looking, black iron door hinges. These bad boys will last for years. 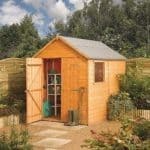 There is no sadder sight in a garden than a nice shed with a lopsided door because of cheap hinges! As well as the door hinges, you get a mortice lock that comes with a key which is also black and fits in with the rest of the door very well. Like the larger versions of this shed you have that gorgeous, Georgian style window that is very strong and made from actual glass…. Not some cheap kind of plastic, but actual glass….. we cannot tell you how excited we were over this! Not only is it glass, but it is 4 mm thick, extra toughened glass. Now on the other Crane sheds this window looks lovely, but thanks to the log store on the side of the shed the window here sits right in the middle of the door and the log store and it looks great! We know that when there is a window on a shed some people are worried about people looking in and seeing what they have…… what are you trying to hide? Just kidding, but we have seen many people put up a curtain or something else to offer just a little bit more privacy. With its strong hinges and mortise lock, The Blickling Shed is not going to just fall over and let people get inside. So as long as you remember to lock the door your belongings will be nice and safe in here. 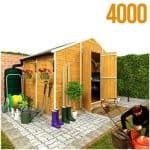 Crane love to offer people a bit of choice when it comes to the colour of their sheds and like the other sheds in this line you have a choice of six colours. The colours that are on offer are Wades Lantern, Painters Grey, Dome Ochre, Terrance Green, Disraeli Green and Earls Grey. There is a good selection of colours so no matter what style of garden you have, you will find a colour here to fit in. We really cannot fault this Scandinavian Redwood. It is strong and along with the boarding of the roof and the floor, you have one tough cookie of a shed. We think that Crane because of the materials they use really do make a strong and long lasting shed. But the log store here as nice as it looks is open to the elements all year round (unless you do something about it of course) so we do have a few concerns over what will happen in the wet winter months to the flooring of the log store. Like we said this is the smallest size this style of shed is available in, but we do think that for most gardens a 6 x 10 size shed is more than enough, especially when you consider the extra space with the log store. We really have to give full marks for this as Crane install the shed for you! That is right they will deliver it and build it. This means there is no stress, mess or poorly built shed at the end of the day. 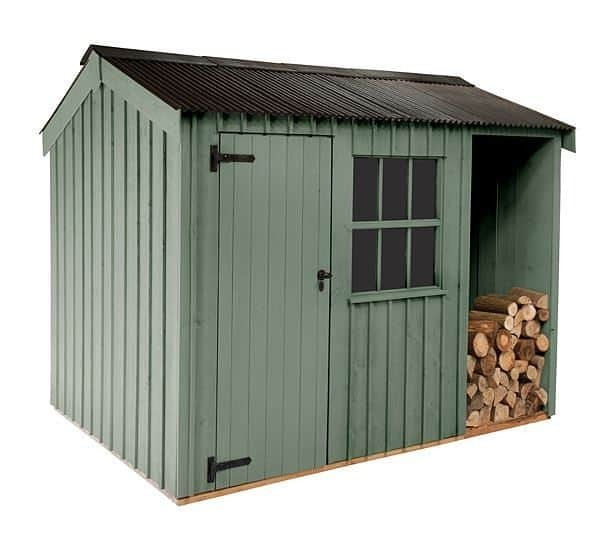 This is an expensive shed, but boy does it look nice. 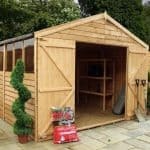 If you want your shed to be a huge feature of your garden and not just a place to store things then this shed would be perfect for that. For you folks though who just want a storage space then the price may be a bit high. Final Thoughts: While this is the smallest, Blickling Shed that Crane offer it is still a gorgeous looking shed and in being the smallest it is also a few hundred pounds cheaper than the larger versions. If you want your shed to be something that really does stand out then we are confident this shed will do just that.